5 fall 2014 self-starting, patient-centered, team-oriented and compassionate." Many residents stay in the area. Of the 604 resi- dents who have completed the Family Medicine Residency Program, 105 have remained in Corpus Christi and 463 relocated in Texas. Many of these physicians now work for CHRISTUS Health and have made the Coastal Bend their home. It's a similar story for the Emergency Medicine Residency Program. 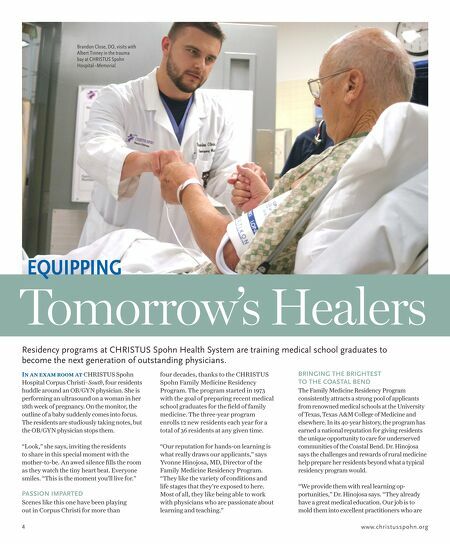 Since CHRISTUS Spohn joined with Texas A&M College of Medicine to form the program in 2007, approximately 25 percent of its total resident graduates now work for CHRISTUS Health. 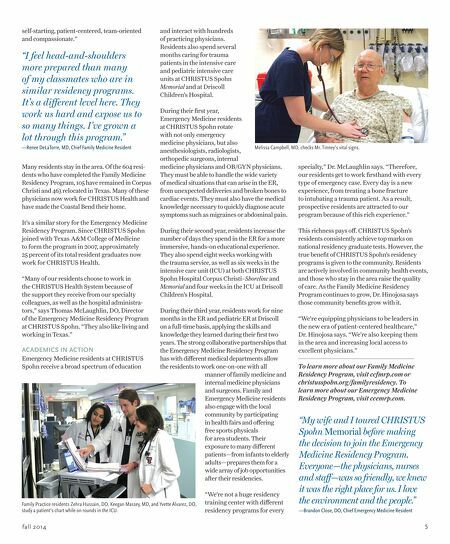 "Many of our residents choose to work in the CHRISTUS Health System because of the support they receive from our specialty colleagues, as well as the hospital administra - tors," says Thomas McLaughlin, DO, Director of the Emergency Medicine Residency Program at CHRISTUS Spohn. "They also like living and working in Texas." ACADEMICS IN ACTION Emergency Medicine residents at CHRISTUS Spohn receive a broad spectrum of education and interact with hundreds of practicing physicians. Residents also spend several months caring for trauma patients in the intensive care and pediatric intensive care units at CHRISTUS Spohn Memorial and at Driscoll Children's Hospital. During their first year, Emergency Medicine residents at CHRISTUS Spohn rotate with not only emergency medicine physicians, but also anesthesiologists, radiologists, orthopedic surgeons, internal medicine physicians and OB/GYN physicians. They must be able to handle the wide variety of medical situations that can arise in the ER, from unexpected deliveries and broken bones to cardiac events. They must also have the medical knowledge necessary to quickly diagnose acute symptoms such as migraines or abdominal pain. During their second year, residents increase the number of days they spend in the ER for a more immersive, hands-on educational experience. They also spend eight weeks working with the trauma service, as well as six weeks in the intensive care unit (ICU) at both CHRISTUS Spohn Hospital Corpus Christi–Shoreline and Memorial and four weeks in the ICU at Driscoll Children's Hospital. During their third year, residents work for nine months in the ER and pediatric ER at Driscoll on a full-time basis, applying the skills and knowledge they learned during their first two years. The strong collaborative partnerships that the Emergency Medicine Residency Program has with different medical departments allow the residents to work one-on-one with all manner of family medicine and internal medicine physicians and surgeons. Family and Emergency Medicine residents also engage with the local community by participating in health fairs and offering free sports physicals for area students. Their exposure to many different patients—from infants to elderly adults—prepares them for a wide array of job opportunities after their residencies. "We're not a huge residency training center with different residency programs for every specialty," Dr. McLaughlin says. "Therefore, our residents get to work firsthand with every type of emergency case. Every day is a new experience, from treating a bone fracture to intubating a trauma patient. As a result, prospective residents are attracted to our program because of this rich experience." This richness pays off. CHRISTUS Spohn's residents consistently achieve top marks on national residency graduate tests. However, the true benefit of CHRISTUS Spohn's residency programs is given to the community. Residents are actively involved in community health events, and those who stay in the area raise the quality of care. As the Family Medicine Residency Program continues to grow, Dr. Hinojosa says those community benefits grow with it. "We're equipping physicians to be leaders in the new era of patient-centered healthcare," Dr. Hinojosa says. "We're also keeping them in the area and increasing local access to excellent physicians." To learn more about our Family Medicine Residency Program, visit ccfmrp.com or christusspohn.org/familyresidency. To learn more about our Emergency Medicine Residency Program, visit ccemrp.com. "I feel head-and-shoulders more prepared than many of my classmates who are in similar residency programs. It's a different level here. They work us hard and expose us to so many things. I've grown a lot through this program." —Renee DeLaTorre, MD, Chief Family Medicine Resident "My wife and I toured CHRISTUS Spohn Memorial before making the decision to join the Emergency Medicine Residency Program. Everyone—the physicians, nurses and staff—was so friendly, we knew it was the right place for us. I love the environment and the people." —Brandon Close, DO, Chief Emergency Medicine Resident Melissa Campbell, MD, checks Mr. Tinney's vital signs. Family Practice residents Zehra Hussain, DO, Keegan Massey, MD, and Yvette Alvarez, DO, study a patient's chart while on rounds in the ICU.